Biotechnology Calendar, Inc. introduces a stellar one-two punch for organizations who like added visibility for their science seminars, events, meetings, conventions, tradeshows and symposia. 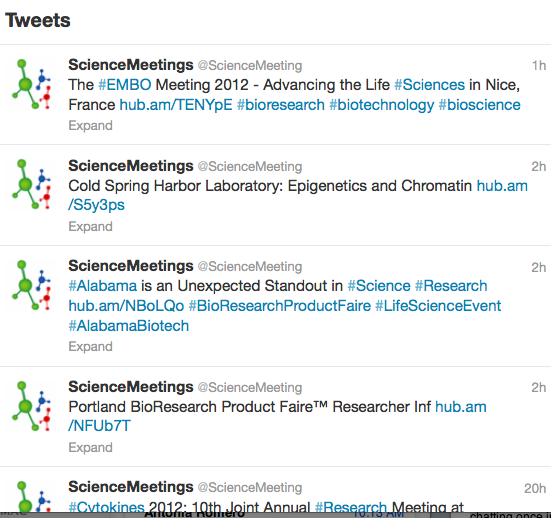 The Science Researcher Update: Spotlight on Meetings, Conferences and Events and ScienceMeetings Twitter feed both keep track of such meetings, and are updated 3-5 times per day. When these events are posted on the Science Researcher Update, most events will also recieve initial social broadcast of the event via Twitter, LinkedIn and Facebook. Each posted event links directly back to the event main page and drives traffic to the event. This makes its easy for you to re-broadcast the events and provide even more visibility!